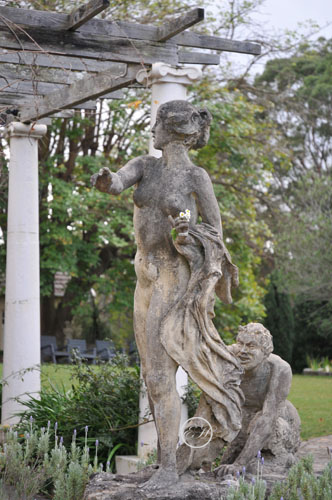 This sculpture work referred to as The Satyr pursuing a Nymph dates back to about 1913 and is believed to be the first sculpture made by Norman Lindsay in the garden. it can be found near the gallery entrance doors next to the seahorse fountain. This piece can be seen in a number of early photographs by Harold Cazneaux. Norman’s older brother Percy Lindsay painted this sculpture in the 1920’s and also painted the nearby classical urn located in the “Roman garden”.